President Obama admits the rise of Islamic State was never properly addressed by the U.S. intelligence. Vice-President of the States puts all the blame on America’s allies, saying it were they who funded jihadists. Terrorists threaten direct attacks on American soil. Is the U.S. ready to respond with more than just airstrikes? Was it really unaware of the growing threat? And were that the allies that gave a helping hand to the radicalism in Iraq and Syria? To find answers to these questions, we speak to FBI whistleblower; Sibel Edmonds is on Sophie&Co today. 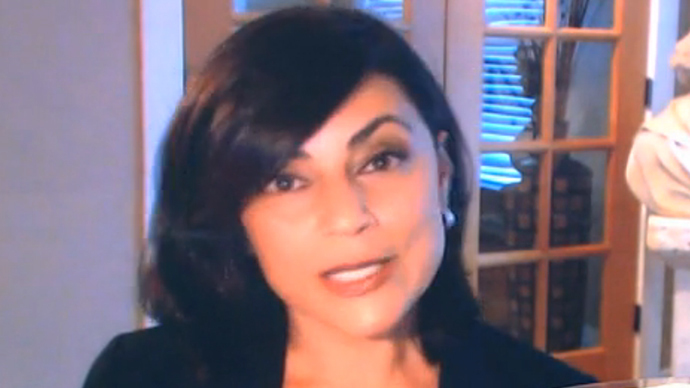 Sophie Shevardnadze: Former FBI whistleblower, author, Sibel Edmonds is my guest today. Sibel, it’s really great to have you on our show. So, when asked if the rise of ISIS was a surprise, Obama admitted that the intelligence community underestimated ISIS in Syria – did it not see it coming in Syria or Iraq? Sibel Edmonds: Well, the answer depends on if you want to take President Obama or the U.S. authorities in their words and evaluate based on that. I think whether the rise of ISIS is mainly about the brand change. Sometimes… sometimes as it happens in marketing we get to see exactly the same principle within the geopolitical games that have been in play for a while now, especially since the end of the Cold War, and the Al-Qaeda brand began wearing off, and that brand now has been changed to ISIS - as always, by design; and, considering the fact that we cultivated and put together and financed and created the ISIS, for me it goes into one of those caricature or funny statements that are put out by the mainstream media, statements issued by people like Obama or anybody from the State Department. SS: So what you’re saying basically is that it was expected for ISIS to turn into something so powerful, into a powerful group, but they are not just admitting to it? SE: To answer the question briefly, the ISIS is what is the U.S. media and the propaganda creators behind the media decided to create. I mean, tomorrow or 3 months from now we will start hearing another name, that we’ve never heard of, and within a month they can make that the world’s greatest or the most dangerous threat. And, again, that is the main concept here, and I know the Western media, U.S. media, the Western media, they have been playing it as such, but they did exactly the same thing with Al-Qaeda. I mean, Al-Qaeda was hundred people, or 100,000 people, or ten million people… Another interesting perspective in this is that I referred to the brand-change, and sometimes you have to switch the brand for the marketing purposes – with ISIS as you can look at and see from the term, from the name now, the brand created, the Western powers have gotten closer to just name and link the entire global terrorism to Islam, and that’s another marketing strategy by the U.S., NATO and main Western countries. SS: Ok. Once again, what we hear from the media is that President Obama blamed the chaos of the Syrian civil war for the rise of ISIS. At the same time, the U.S. doesn’t hide that it’s been helping the rebels in Syria from the very beginning. Did the U.S. intelligence know who they are funding? SE: Absolutely, as they did in 80s with the Mujahideen in Afghanistan, as they did it with various so-called Islamic terror cells within Caucasus and Central Asia, as they did with Al-Qaeda, and this is not different. As I’ve said, you’re only looking at a brand change; you’re not looking at any kind of a new phenomenon, as far as the U.S. global perpetual warfare is concerned. SS: Now, the U.S. is only ramping up support for moderate rebel groups in Syria – or so they say. So, who works to determine if rebels are moderate or no? Is there really a way of knowing that? SE: Again, it is really to talk to or talk around all these propaganda created by the Western powers through the mainstream media, and I feel that if I start even commenting on that, its belittling the facts on the ground. Again, I want to go back and provide the context, and say: look, Mujahedeen, which later became aka Al-Qaeda, they were the freedom fighters. So, and we have had similar situation in the Balkans during the war. You know, you had people or the factions that were considered fanatics or criminal or terrorists, whether it was KLA, and then they became “freedom fighters”, they became our allies. You’re looking exactly at the same thing. Different brand, but you’re looking exactly at the same phenomenon, and we can talk around this and bring in all the different factors, they should put forward by the Western media, and then we can put it and compare it, what has been happening in the past 30-35 years, and we’ll see that the marketing strategy is the same, it’s just a brand differs. SS: What we’re seeing right now is that the U.S.-led airstrikes in Syria aren’t stopping ISIS – well, at least not yet – and the Kurdish fighters on the ground are asking for the ground support. Will the U.S. be sending troops to fight ISIS on the ground? What do you think? SE: That’s going to depend on various factors, on what’s going to happen. I’m going to go back to context and history – the Kurdish factions and the Kurdish factor has always been used and played. The Kurdish faction and the Kurdish factor was the case when we had the war with Iraq. We had the northern territory and the Kurdish area, and then we always get to “Okay, what is going to be Turkey’s role? Are they going to be weary of what’s going to happen afterwards, if this happens with us and the Kurds?” And again, you’re looking at exactly the same replicate of what we had in place, what was taking place during the initial stage of war against Iraq. SS: Right now, the U.S. military actions in Iraq have one set of objectives, and then, in Syria, another – for example, Kurds in Iraq receive so much aid, so quickly from the U.S. – unlike the Kurds in Syria. What, is it, like, two kinds of brands of Kurds, like you say? Why is to assume 2 different strategies when fighting one enemy? SE: Absolutely. You have the Kurds in Iran – and you’re looking at totally different characteristics and where do they stand within the… Looking at there, there are over 25-30 million Kurds, and the Kurds in Syria, we have Kurds in Turkey, you have the Kurds in Iraq, the Kurds in Iran; and right now the game and the play being centered around the stage in Syria, so we’re looking at a different mechanism there, then maybe, we’re looking at what’s happening with the northern Iraq. And also, you have to look at oil factor. What do we have in Syria, where the Kurds are concentrated, versus what we have in Northern Iraq, in such places as Kirkuk and well, do we have an oil factor there or we don’t have it there? So, if you start putting those kinds of information that comes with region and a different sects, let’s say, in this case – Kurds, you’re looking at several different factors in play, you’re not looking at only one, so you’re not looking at the Kurdish faction, and here are the Kurds, and trying to, basically, put the ball in the same bucket. It all depends on the geostrategic facts, and what we’re facing, what we have, what is in play, what is at the stake – and, again, you can never compare Northern Iraq with what’s happening in Syria and the Kurdish region in Syria. SS: Yeah, because I was thinking maybe they were not helping the Kurds in Syria, because they’re affiliated with the Kurds in Turkey, and America, maybe, doesn’t want to upset Turkey, being one of its greatest allies, no? SE: No, not really, because you had exactly the same scenario with the Kurds in northern Iraq and they Kurds inside Turkey. If you look at the border region and the cross-border activities between the Kurds in Iraq and the Kurds in Turkey, we had exactly the same situation – and this was one of the main reasons that Turkey did not want to allow U.S. using it’s airbase during the early stage of the war against Iraq. It was about the Kurds in northern Iraq and how that would upset the equilibrium that the Turkish government wants to preserve and keep in place as far as the Kurdish faction is concerned. SS: Now, the former CIA chief and the ex-Defense Secretary Leon Panetta said the U.S. is looking at at least a 30-year war against ISIS, which is not at all what the White House is telling the public. Is he exaggerating? What’s your estimate? SE: I would say it’s a very short period; I’m really surprised, because we just talked about the brand change. The war against Al-Qaeda was declared as a “forever war” and it has been expanding. I mean, when the war against Al-Qaeda started, it was supposed to be in Afghanistan, and we started chasing Al-Qaeda in Yemen, and Pakistan with all the drone attacks, Al-Qaeda in Iraq, and the fact that this was going to be a forever war… and now that the brand has changed to ISIS, I’m very surprised that the former FBI director is stamping it with a short-time period. I believe 30 year period is very short, unless that have already in plan other sects or other factions that they are going to declare the “world’s great and most dangerous terrorists”, I would say it’s a very short period of time. We currently are more interested in an ongoing, never-ending, perpetual war, so I would, if you compare it with what we have been characterizing - or our government and the media – Al-Qaeda, I’m surprised that he has put such a short time-stamp on ISIS. Considering the attraction, or the attractiveness, of the brand, because it has the world “Islam” built into it, and let’s just forget Al-Qaeda. I mean, Al-Qaeda was the just the noun, the name – and this case you’re looking at the far-reaching implications. Now you declare that current greatest threatening organization that has the word “Islam” built into it – and I think it’s much more attractive to be used. So, I would say, yeah, it should be forever. I’m surprised it’s 30 years. SS: Now, U.S. Vice-president Joe Biden blamed Saudi Arabia, the UAE and Turkey for helping extremists in Syria – then he later apologized for his comments, but was he right? SE: Rather than dignifying people like Biden, let’s talk about, again, context and history – and I’m going to be repeating that, and I’m sorry if the viewers are going to say “how many times is she going to say “context and history”” – well, my website, my news organization was the first one to really break within the U.S. the training of the Syrian rebels in Turkey, and this was 6 or 5 months before anything about Syria actually made it to the news; using a U.S. airbase – and this is in Southern Turkey, close to the border with Syria – and this was NATO and the U.S. factions training and arming and sending back, having them cross the border, rebels, long before Syria actually became the news. As I said this was done in Turkey by the NATO forces, mainly U.S. and British forces, and it was something that was planned and designed and implemented by the U.S. So, for Joe Biden to come and put this out right now… of course he will get away with it, because the mainstream media here is not going to go and revisit the facts that were exposed with the activities of the U.S., what they did in Turkey, training these faction – now it’s called ISIS, it’s like the French fries or the freedom fighters: you’re looking exactly at the same fries at the same price. That’s all I’m going to say, it’s just ludicrous. Then he took it back, because he upset the current president in Turkey, Erdogan. I wouldn’t even find it newsworthy, but it’s funny. SS: “Funny” is the right word. Why is it more important for Sunni countries like Qatar or Turkey to bring down President Assad than to contain extremism? Because, the Qataris are helping the anti-Assad rebels and Turks asking Kurds to turn against Assad before they get any help with ISIS – why? SE: In reality, if you’re looking at the factual objective and the analysis of it, really, it’s not to their advantage whatsoever. I mean, you just named the countries, for example, Turkey is a member of NATO and Turkey is greatly managed and directed by the U.S. – has been for a several decades, there’s no question about that – and then you’re looking at the United Emirates and the countries within the region, including Saudi Arabia, you’re looking at the tentacles of the United States. I call them the “tentacle nations”; so, if you start looking and say “what is their advantage?” – of course, there are no advantages, and you only look at disadvantages. If you start polling people within these countries, and I can speak of Turkey, for example, if you start getting the opinion polls in Turkey, you will see that over 90% of Turkey are against such moves; and Turkey had a pretty good relationship with Assad and with Syria, they’ve engaged in some really good level of commerce. There has been zero advantage. They have to implement policies created, designed and issued by the U.S. and NATO, and that’s what they are doing. So, to answer your question – it has never been question of any other nations, especially in the region, their interest or their advantages or even comparative advantages. It has always been about what is designed, what is put in place, what orders are issued here in the U.S., and that’s the end of it. Other people’s interests, other nations interest is not even in the equation, it has never been. If you ask a populous people in those nations, they would actually nod and they would say yes, that’s exactly what they believe – because that’s the reality. SS: All right, here’s another possible and interesting turn of events – FBI chief James Comeywarned terrorists are working on an effort to attack the U.S. very-very soon. Is the U.S. ready to respond? SE: We have to look at different things and see why this statement was made. Is it based on some sort of facts and real solid intelligence gathered, or is it the fact that… for example, we have had for the TSA, for the flights, the threat level has been really low, and when that goes for a long time, people get antsy, they say “This is really annoying to have all these screens out there and going through them, we haven’t had any terrorist threats really, the level has not been blinking red or even orange, it’s been yellow, let’s go through the rainbow colors” – so, it’s time to re-energize the Americans with the fear of terrorism. We need to have more expenditure for things to put in place, because we can go ahead and increase the threat level within the airports. Let me give you an example. If you look at the stock market and stock prices for all the military-industrial complex-related companies and firms, you will see how they have just gone up tremendously since the brand switch from Al-Qaeda to ISIS, and this is, again, the brand-change I’m referring to, this is when you say “yes, now we can go ahead and produce and sell more to the government and it will spend billions more”. So, the same thing is true for the internal security, fear-mongering factors on the ground in the U.S. It’s time to re-energize that fear, and that is exactly what they are doing. What’s going to follow this is there’s going to be more measures put in place, whether it’s in the airports, or whether it’s the hiring within the FBI, or increasing the number of informants. Those are the things that are going to follow this announcement: “we have to have more expenditure, because of the public consent, because the fear level is going to go up, and therefore those expenditures are going to be justified” – and it is that simple as that. SS: The FBI also says that dozens of Americans are believed to be fighting in Syria with rebel groups. How did that happen? SE: Well it has to happen. If it’s not the case, it has to happen, because you’re looking at…how ordinary Americans perceive these things? Think about it: Syria and this area, that region in Iraq – they are thousands of miles away, what can they do to us from there. So, it’s not enough to raise the terror threat and really do some heavy-duty fear-mongering. But, if you bring some U.S. elements and ties there, if we have Americans over there, who are going to come back here, and they are going to, you know, be our boogey-men on the ground, and they going to blow up buildings – that’s going to be marketing-wise more attractive, and it’s going to be easier to sell to the American public the notion of our war against ISIS. You’re not going to hear much of the Al-Qaeda for a while, Al-Qaeda is going to disappear and exit the stage, replaced by ISIS – so yes, this is another marketing strategy. If we start looking at what’s happening, what has been happening and what is being put forward by these people, including the former CIA director and the U.S. – and if you start looking at it from the marketing perspective we get to find more answers and understand what’s going on, rather than trying to approach this through some logical, political, philosophical or even sociological analysis. I think the best model that fits and explains what’s happening right now is the marketing model, and we should look at it as such. SS: Twitter is suing the FBI because it is not allowed to tell the public when the government asks for surveillance help – why is surveilling Twitter such a big deal for the U.S. government? Does so much depend on Twitter and other social media? SE: No. Why surveilling all Americans through NSA with their phone, every single conversation is such an important thing for the government? Again, I’m going to take us back and say what kind of reaction from the public does this create? When we hear every day how much is being gathered from the Facebook is true and what’s being gathered and collected and how people are being monitored through their Twitters, combined with what we have already known since 2004-2005, the expose on NSA, you have a better chance of controlling the majority, controlling the people. SS: Can the FBI and CIA, NSA control their information; prevent it from gaining public attention. Like, what can prevent people like you, for instance, or Ed Snowden, from speaking out? SE: Nothing. Nothing prevents people from speaking out. I have been speaking out. I don’t think the U.S. government is really bothered. If the U.S. government is really bothered by people who are speaking out, people like me or some credible, real whistleblowers, and if that becomes a real threat, it’s very easy for them to take out those people, to eliminate them. But they are not, because it’s hasn’t risen to that level yet. If the reach were such and if the consequences of people speaking out really reached a real masses and brought out some reaction – then you would be looking at totally different scenario, or the reaction ,or action, by the U.S. government. But we haven’t seen it yet. SS: Sibel, thank you so much for this wonderful insight and for your take on things that are going on around us right now. We were taking to Sibel Edmonds, FBI whistleblower. We were talking about how the U.S. government is handling the situation around ISIS. Thanks a lot for your thoughts, that’s it for this edition of Sophie&Co, I will see you next time.